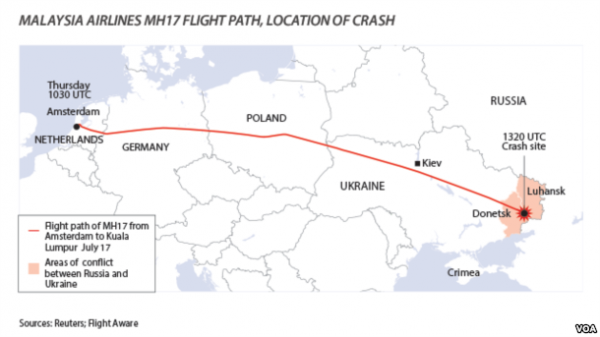 International investigators say a Malaysian airliner that crashed over eastern Ukraine in July 2014 was shot down by a missile that was transported into the country from Russia. The findings released Wednesday confirm an earlier investigation by the Dutch Safety Board that concluded Malaysia Airlines Flight MH17 was brought down by a Russian-made Buk missile, a claim Russia has denied. “It may be concluded MH17 was shot down by a 9M38 missile launched by a Buk, brought in from the territory of the Russian Federation,” said Wilbert Paulissen of the Dutch National Police. Paulissen said evidence shows that pro-Russian rebels requested the deployment of the surface-to-air missile and reported its arrival in eastern Ukraine. Netherlands chief prosecutor Fred Westerbeke said investigators have identified about 100 who were involved in the missile attack “one way or another.” He stressed that “a clear impression of the chain of command” must be established before it could be determined if they were culpable. The previous investigation identified a 320-square kilometer area where it said the rocket launch must have taken place. Authorities did not explicitly say who had fired it, although all the land was controlled by pro-Russian separatists fighting Ukrainian forces. In a move aimed at preempting the new findings, Russia on Wednesday said its radar data proved that no rocket was fired from within territory held by pro-Russian separatists in Ukraine. On a conference call with reporters, Kremlin spokesman Dmitry Peskov said Russian radar identified all flying objects over the rebel territory, and there was no rocket. All 298 passengers on the Boeing 777 died after it broke apart while traveling from Amsterdam to Kuala Lumpur, Malaysia. Prior to the formal announcement of their findings, prosecutors met Wednesday morning with family members of those deceased. Dutch police say the latest findings, in addition to those from an earlier investigation, may be solid enough to be used in a criminal trial. Prosecutors cannot file charges at this time because international investigators have not agreed in which court to hold a trial. The downing of the plane was a major factor in a decision by the European Union and the United States to impose sanctions on Russia, leading to an rise in East-West tensions to levels not seen since the end of the Cold War in 1991.